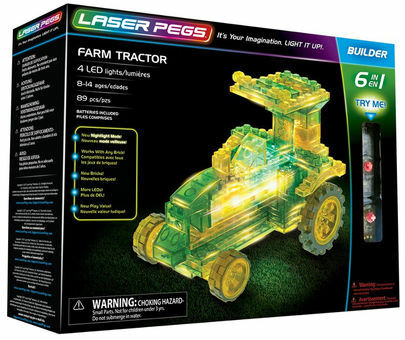 Show the farm who’s boss with this hard-working 6-in-1 Farm Tractor kit from Laser Pegs® Builder! Choose from 6 different tractors including the Row Crop Tractor, Garden Tractor, Canopy Tractor, and many more. Whether you’re tending, cutting, or pulling you can make the job more exciting by lighting up your creations with the exclusive 2×8 Power Base!